5Kevents.org offers 3 designs of insert medals for those of you who want to avoid the cost of “custom” die cast medals. We have purposely kept the design options to a minimum to keep your cost down. Provide us with your event logo and any information you want on your insert. We will send you a proof of the art before printing. Allow 5 days in production and 2 to 3 days shipping. Order in advance to avoid delays. WE WILL BUY BACK ANY UNUSED MEDALS! Just ship us back any medals you have not used or applied inserts to. (Must be in the packaging and returned within 10 days after the event). Credit applies to Medals only and does not include shipping or set-up fees. WHY DO WE DO THIS, NOBODY ELSE DOES? #1 We know predicting the number of medals needed is next to impossible, better to order too many then not enough. #2 Participants get mad if you run out of medals. #3 It will increase the profitability of your event. #4 We hope that it will create a loyal customer. A recent survey by RunningUSA shows that thirty-six percent of running event participants consider receiving a medal an important factor in choosing the races in which they run. 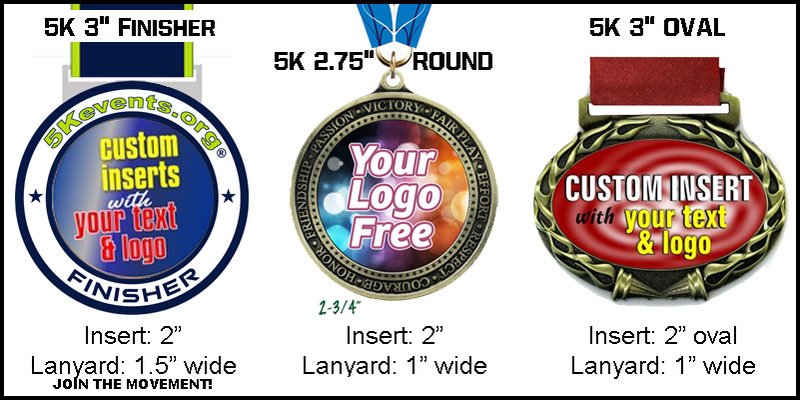 If you’re looking to create a custom die cast medal for your upcoming event, do not hesitate to contact us. Our team of artists will assist you in creating a unique design that enhances your event brand. All medals also come with lanyards. Custom Lanyards are available: Ask for an estimate with order – A Great Sponsorship Opportunity!